Women on a Mission: Mom Edition: TEA LESSON PART TWO: Sun Tea! ...except on Girls Trip, we sipped some brew of another sort. Lori judges a restaurant by its ranch dressing and whether they brew iced tea or try to pass of the powdered stuff. These are strict standards. Now for me, the powdered tea, unsweetened, is great. My Michigan family are big iced-tea drinkers too, and we keep the jar of powdered tea on hand at all times so we never run out. Holla to Aunt Pam! All of us kids knew that Aunt Pam’s tea jug (and we’re talking 10 gallon drum size) was always full and cold. She must’ve made batches of tea constantly. No way you could keep up with brewed iced tea with that demand. So yes, I love me some powdered tea. Lori, not so much. She’s got stringent requirements – that will be a Part 3 to these tea posts. She’ll school us all on brewing a perfect cup of iced tea. I got my glass sun tea jug in O’Neill, NE, where Dad lived when I was in college till he retired in ’07. It has come out every summer to make me delish and refreshing tea. The secret – I don’t really think there is one, except to make sure you have sunshine and the proportionate amount of tea bags. 1) I fill my tea jug with cool tap water – doesn’t need to be cold nor does it need to be roasting hot – room temp will do just fine. 2) I suppose you could use any type of tea you wanted. Standard black tea in bags are perfect. Lipton makes ‘cold-brew’ iced tea bags, but I have only tried them once and wasn’t blown away with the results. 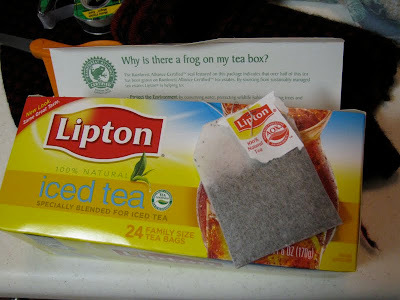 My new summer stash of tea bags this year is Lipton’s iced tea bags – made special for iced tea. Leapin’ Lizards! 3) The Lipton iced tea bags look bigger than regular black tea bags. I really had to guess how many to use – I want enough tea to make it taste just right, but I don’t want too much to make it bitter. I selected five bags. Turns out, it was perfect. You may wish to use 6-7 if you have the smaller traditional black tea bags. 4) Place the teabags in the water, LEAVING THE STRING PAPER TABS STICKING OUT. That way you won’t have to fish the tea bags out when it’s done. Screw or seal the lid and set the jug out in the sun for 4-6 hours (or a workday). 5) Take out the tea bags, and I pour my tea into a refrigerator-size jug to keep it chilled and at my beck and call. IT’S PERFECT! You can read the box your tea comes in – all sorts of antioxidants are in tea. Caffeine too, though caffeine-free versions are available. I’m pretty sure that iced tea is a little better in the antioxidant scale than my beloved Diet Coke. Baby steps, Friends. So, I am not an ice tea drinker among the land of the sweet tea worshipers. So, I am so appreciative of your tutorial. I screw tea up every time I try to make it for my friends. 5 tea bags? I just buy the family size bags and use those. Funny you posted this bc I have "make sun tea" on my white board on the fridge. You should get a magnetic white board Pephy, they are super slick.